The perfect Saturday morning includes all of the following: a lie-in, bacon and eggs, the Guardian weekend, and aimless faffing. 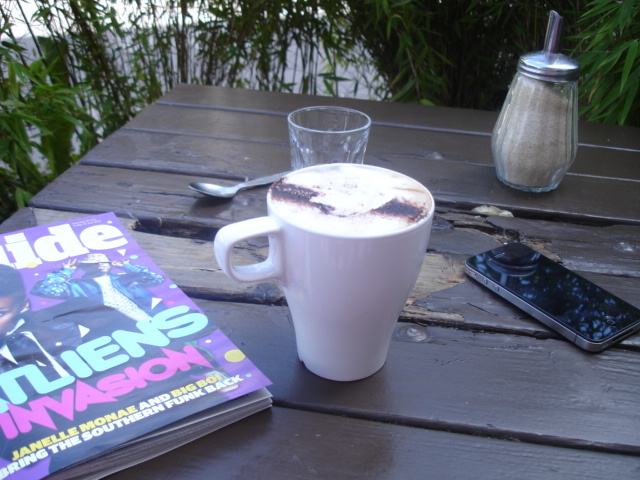 Then before heading off for the day, a nice relaxing coffee. Which is where Opus comes in. It’s a self-proclaimed “friendly neighbourhood coffee shop” run by Philippe Castaing who also owns the gorgeous restaurant upstairs, called…Upstairs. It has the Saturday papers and French Vogue (oooh get you) and is filled with a relaxed crowd. 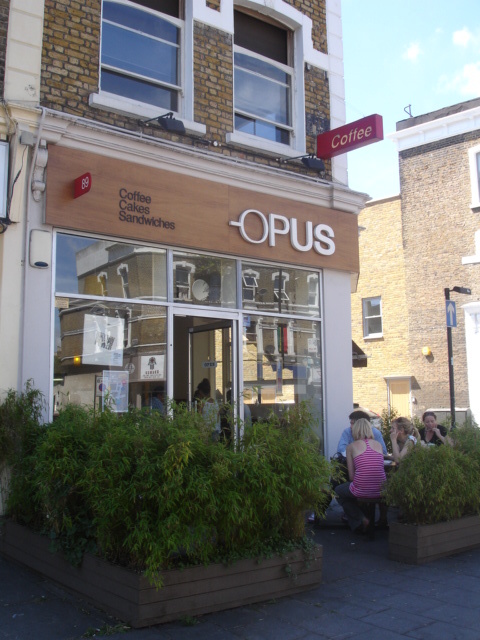 Perfect to go along for a chilled out coffee and cake, and they make delicious paninis. It’s also a good place to pick up flyers about local events – I picked up a flyer for the Urban Art fair on Josephine Avenue next weekend. Philippe is at the forefront of the Brixton regeneration and it makes me feel like I’m at the heart of what’s going on when I’m there. 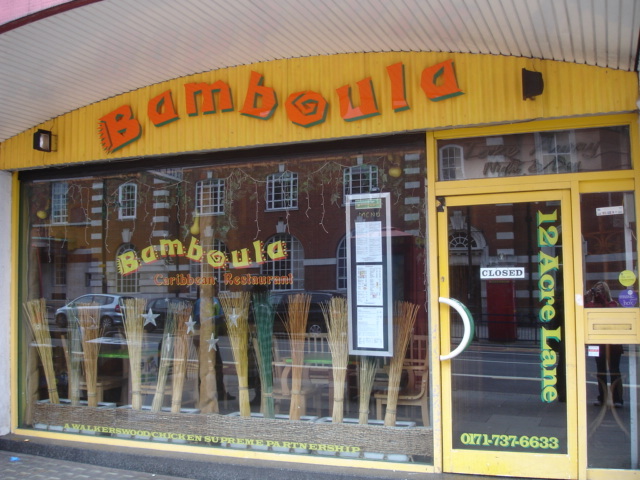 Bamboula is a simple, relaxed little Caribbean place with a good atmosphere and mixed crowd, great reggae beats and soulful food. El G, The Man From Snowy River and I went along on Friday but was very sad to hear that they’d run out of Jerk Chicken by 9.30pm – boooo! 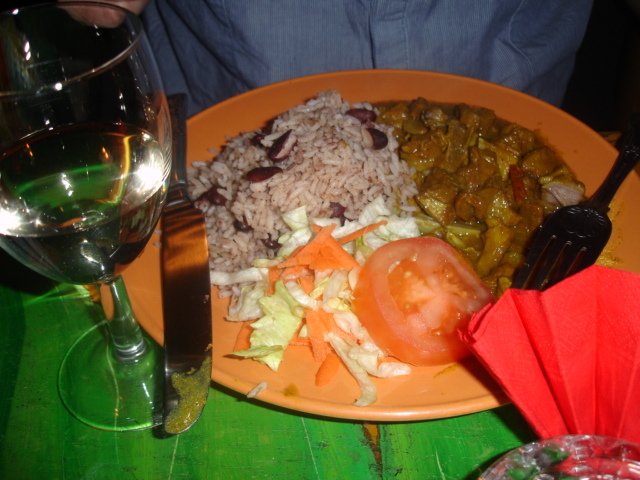 I’ve been a few times already and the jerk chicken has been great, but instead I had ackee & saltfish and the boys had curried goat and chicken curry, all eaten with rice and peas (very tasty), and freshly-made coleslaw (nice and tangy – goes great with the food). 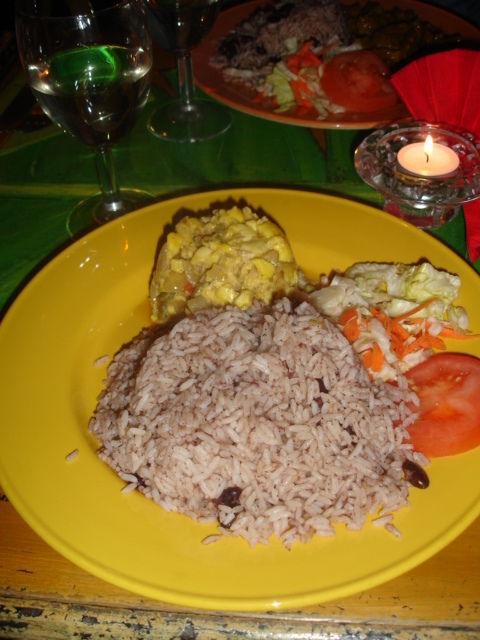 I’m sad they aren’t doing ackee & salfish as a starter anymore as its a great dish to share and good for newcomers to this kind of food to try out – but I loved it as a main too – really interesting, salty, delicate mix of flavours and textures. The meat in the curries was sadly filled with bones, but cooked in a lightly-spiced sauce which our Aussie friend summed up the next day by saying it simply sat really well with him, giving him a great night’s sleep. This isn’t the most delicate cooking but its what I think of as soul food, because its homely and makes you feel good. Oh and I’d recommend a beer or the rum cocktails over the wine which doesn’t really sit right with the food and is always served pretty warm. A main course each and bottle of wine between 3 was £17 each. Here is a snapshot of my favourite places to go in Cla’am (disclaimer: some of which may not be as good as they used to be!). 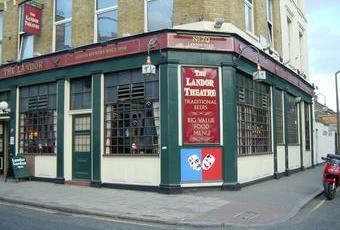 The Landor – my great friend Niki and I lived pretty much opposite (and in) The Landor for about 3 years. Good old man’s pub with pool tables, where you can always get a seat and some decent pub grub. Has a huge beer garden that is inexplicably neglected in favour of the packed Falcon and it even has its own theatre which recently showed the critically acclaimed “Stockwell”. The roasts are perhaps not as good as somewhere like the Calf but its still a chilled out comfy place for a quiet pint. 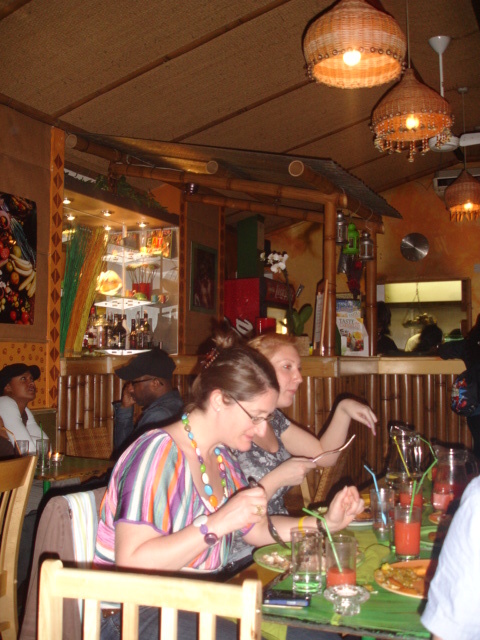 La Terraza – Awesome authentic Spanish tapas bar, restaurant and music venue on Bedford Road. I’ve been in with El Grumpo and also with some drunken friends having spilled out of The Falcon and both times had a wicked night – great food, regulars at the bar, keyboard players doing Spanish music and a collection of locals dancing the salsa. Has a terrace outside in summer where I drool over people eating calamares with a cold beer. The Loft – Run by the brilliant recently-refurbished Plan B guys, it bizarrely won Time Out’s best bar prize and I wouldn’t go that far, but during the week it is a great spot for drinks with mates in a “New York” warehouse style bar with views over Clapham high street. Good cocktails, lounge seats and music but the food is average at best, and at weekends it’s packed. They are currently doing 2 courses for £2 on their winter restaurant menu and 50% off roasts on Sundays. The Calf – dark and almost gothic with wooden floors and tables and velvet curtains, the Calf has an amazing selection of beers, cider and wine, really good pub grub and roasts, lovely bar staff and with board games liberally strewn around and large comfy sofas, the sort of place you can roll up, curl up and stay all day. Cafe Cairo – this is apparently now closed because of a fire but in case it has re-opened I wanted to include it as it was probably the most interesting place in Clapham. It had an upstairs Moroccan tent style room where you sat on the floor while drinking red wine, smoking a shishah and eating humous, merguez, pitta and greek salad. Small room downstairs with crazy house DJs and wild party crowd. Post-smoking ban they appeared to simply cut a whole in the roof but not sure how shishah smoking would continue in winter. Lets hope it re-opens! The Stonhouse – comfy, cosy warm pub to go for delicious steaks and red wine. Four O Nine – Impeccable service and posh grub just above the Clapham North. Great for taking your mum, your best friend and for a date. Pretty much permanent 50% off food through toptable so if it’s struggling, take advantage before it disappears. Not as good as Upstairs on Acre Lane though. 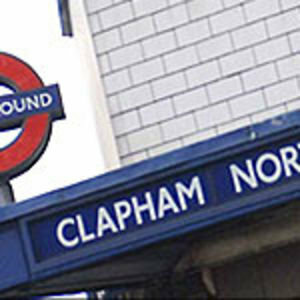 Clapham Picturehouse – lovely local cinema featuring interesting mix of films and a homely little bar. Or try the Brixton Ritzy, its sister cinema, which is housed in a sprawling old Victorian building with quirky bar and roof terrace. Sadly, ticket prices aren’t cheap but that seems to be across the board in London. Fish Club – Fab fish and chips in a minimal, basic restaurant. Potted crab, battered haddock and plaice with fish and chips and musy peas are all delicious and fresh – I’d like to go back to try the grey mullet, bream and seafood. Secondo – great vintage clothes shop under the arches next to Clapham High Street station. Great cakes, quiches and pies, and great selection of vintage clothes, shoes and furniture. Also check out their Brixton sister shops. Tsunami – stylish Japanese restaurant on Voltaire road. Good selection of sushi and sashimi and great mains like black cod and Wasabi steaks. 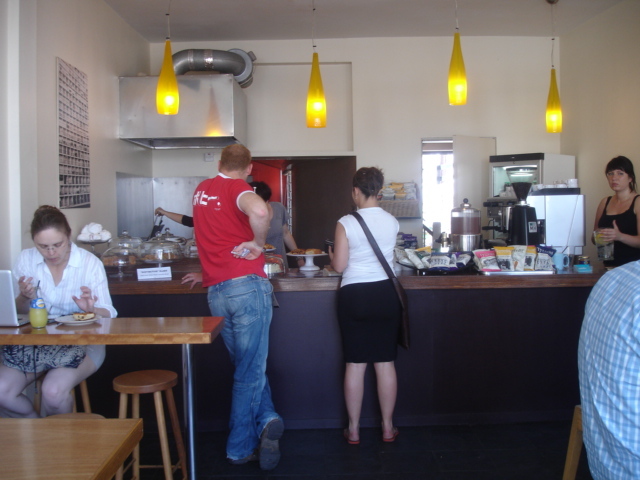 Esca – buzzing deli with large sharing tables and a great selection of sandwiches, cakes and salads. Good to pick up a coffee and read the paper, and to buy nice ground coffee and other kitchen treats. Not cheap though! Special mentions go to The Falcon (old favourite but don’t like the new squished up garden and suddenly full of very young people, either that or I’m suddenly older eek), El Rincon Latino (good tapas bar), Belgo Bierodrome (yummy moules frites), So:UK and the White House (both were very good “back in the day” for girlie cocktails and a dance), Traders (beer and dim sum, great combination), Gastro (authentic French restaurant with decent food and great wines served in cute little tumblers, sadly a little overpriced), Metro (romantic garden restaurant) and Arch 639 (for having a name we always got wrong and managing to combine good DJs and pool with the narrowest bar in the world – weekend nights sometimes a bit hit or miss though). Aquum is nice in summer to sit outside and drink wine, although the white leather seats and poncey bouncers put me off going at any other time. Infernos was my special place during law school but no longer will I cross its threshold. I’m also dying to try Breads Etcetera for its wonderful sounding breakfasts including Scandanavian breakfast with fish roe, cheese and ham and DIY toast – yum. A wonderfully simple, intimate dining experience. Upstairs is in a Victorian house that has been split into downstairs coffee shop (Opus), 1st floor bar, and upstairs restaurant with about 8 tables and a fantastic small menu where everything is good and the wine is even better. You normally start with drinks at the tiny bar on the 1st floor, which could be someone’s living room. You are then escorted to dinner on the top floor. Although there are reports that the menu is lacking of late, and I was a bit disappointed to see leek and potato soup as one of three starter choices which I thought was a bit safe, the food is generally wonderful – French, tasty, delicate. I had one of the best starters I’ve ever had there – rabbit ravioli – which was intricately made and packed with flavour. The menu offers only 3 choices of starters, main and dessert, but I like this – shows confidence and you know anything you order will be superb. Is up there with Chez Bruce standard cooking in SW London. Wine list, as a French run place, is superb and the cheese plate is fantastic too. Run by the inspirational Philippe Castaing, who has an inspirational vision for Brixton and is making it his business to transform Acre Lane. Small, quirky and romantic. UPDATE 12 August 2010: Sadly I’ve been back twice since I wrote this post and I’ve been disappointed both times. Philippe and the other staff there weren’t particularly friendly and the food, although good, was a little unambitious and unimaginative. It was also incredibly expensive for what you got too (around £70 each for a 2 hour meal). I sadly won’t be back again until I hear better stories and as promised I haven’t written up my bad review because I only want to dwell on the positive. Come on Upstairs sort your shizzle out! I still love Opus though – see my review here.